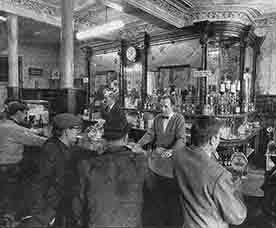 Interior view of Ruxton's Bar. 1971. This old pub dates back to 1867. William Gilmour was the first licensee. He was not new to the licensed trade as he occupied a public house as a wine and spirit merchant at 7 Greenhill Street, Anderston since 1860. He lived at 2 Bothwell Street in Anderston. When he acquired the new premises at 21 Elderslie Street in 1867 he was living at 77 Dumbarton Road before moving to Elliot Street. In 1875 he was also trading at 539 Springburn Road, 41 Cowlairs, Road and Greenhill Street and later acquired premises at 117 Bishop Street, by this time he was living at 176 Kent Road. The premises at Elderslie Street was taken over by a well-known publican William Reid in 1900, the pub was then known as the St. Vincent Bar. Mr Reid continued to serve the locals here before the first World War. James Butter then took over in 1916. During the 1920s David Ruxton was running the pub very successfully. Jessie Ruxton, David's wife took over as licensee when David passed away in 1937. Their son Charles took over the running of the pub from 1947 until the pub closed in the 1970s. Americans buy a Glasgow bar as a TV prop. One of Glasgow's oldest pubs is to be demolished, but will live again as a prop in TV studios in San Francisco. The pub is Ruxton's Bar in Elderslie Street, which comes under the Anderston redevelopment scheme. Before the bulldozers move in early in the new year the whole interior of the pub, mirrored gantry with gleaming glasses, glossy varnished tables and stools, and curving bar, will be dismantled and shipped to the United States, where they will be re-erecting at the Californian television studios. The "takeover" began when Lanarkshire antique dealer Tony Kierney dropped into the bar one night and got talking to the owner, Mr Charles Ruxton (51), whose family has had the pub for 47 years. In the "Scottish Licensed Trade News" today, Mr Ruxton said, "This chap just dropped in and said he was intrigued by the place and our fittings and that he had just returned from a business trip to the United States, and that he'd like to buy all the fittings, lock, stock, and beer barrel." Mr Ruxton continued, "I'll be sorry to see the place go, but this is obviously much better than having it bulldozed. "And, who knows, we might see the old shop popping up now and again if any of the television programmes made there are shown in this country." Mr Ruxton expects to be opening a new pub across the road from the old premises, and the name will probably be the same as it has been for the past 47 years. 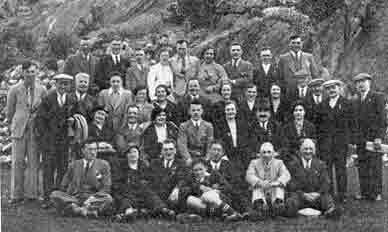 Included in this happy group from the 'Ben' are Mr. W. Ruxton; Mr. W. R. Anderson (Kilmarnock Arms, Kilmarnock. ); Mr. W. H. McAllister and Mr. E. Ewart, both of Johnny Walker, and ladies. 1973. Mr. Charles Robert Ruxton with his new bride Lillian. 1950. The wedding took place at St. Margaret's, Episcal Church, Renfrew, of Mr. Charles Robert Ruxton, eldest son of the late Mr. David Ruxton and Mrs. Ruxton, 5 Pembroke Street, Glasgow, to Miss Lillian Williams, daughter of Mr. & Mrs. A. Williams, 1 Mary's Lane, Renfrew. Mr. Ruxton has been licensee for two and a half years at premises at 21 Elderslie Street, Glasgow. His brother David, who is a licensed grocer in Dalry performed the duties of best man. 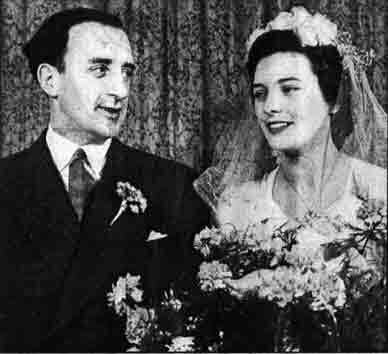 The bridesmaid were Miss Helen Williams, sister of the bride. The reception was held in the Georgic Restaurant, Union Street, Glasgow. Mr. David Ruxton with his new bride. 1946. Home on leave for his wedding. 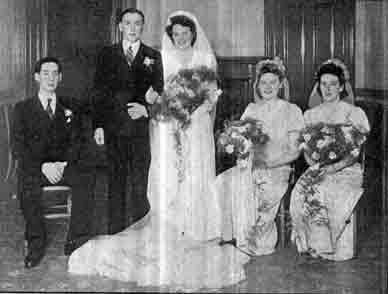 The wedding took place in Augustine Church of Scotland, Rutherglen Road, Glasgow, on Thursday 14th March of Mr. David Ruxton younger son of the late Mr. David Ruxton and Mrs. Ruxton, to Miss Jean Jessamine, eldest daughter of Mr. & Mrs. William Jessamine, 200 Waddel Street, Glasgow. The grooms mother held the licence at 21 Elderslie Street, Glasgow and her husband who died in 1935 was a well-known and popular figure in the licensed trade in Glasgow. Best man was Mr. James Adams and two bridesmaids were in attendance to Miss Hetty Jessamine, sister of the bride and Miss Betty Ruxton, sister of the groom. Following the wedding ceremony conducted by the Rev. J. G. Taylor, a reception was held in Partick Lesser Burgh Hall, attended by a hundred guests. The groom had been for three and a half years service in the Armoured Corps with the 3rd Kings Hussars. He came home on leave from Palestine for his wedding, prior to enlistment he was in the business at 21 Elderslie Street. Mrs J Ruxton with staff on an outing dated 1937. The Beauties of Glendarule were investigated by this happy band on a recent Sunday. They are the staff and friends of Mrs J Ruxton, wine and spirit merchant at Elderslie Street. 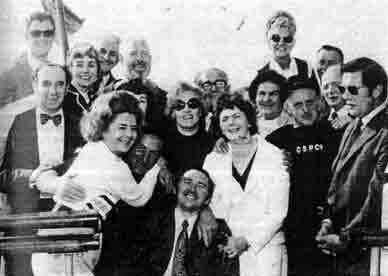 Mrs Ruxton is seen seated in the centre, while other well-known figures in the group are Mr David Spiers and ex-Bailie J Ratcliff.